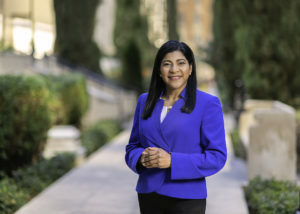 As vital member of LADWP management we recently sat down with Evelyn Cortez-Davis, Assistant Director of the Water Resources Division to get her take on the important work she does on a daily basis and what it means for women in her field. As a licensed Professional Engineer (P.E.) and a Board Certified Environmental Engineer (BCEE), what is your view on the role women play in STEM (Science, Technology, Engineering & Math)? The contributions and innovations of women in all fields of STEM are critically important. Just this year, we have seen history made with Dr. Karen Uhlenbeck winning the 2019 Abel, the “Nobel Prize” in Mathematics, and we will hopefully see NASA’s first planned all-female spacewalk soon. Women’s voices in STEM are helping bring together diverse ideas to solve today’s complex problems. Right here in Los Angeles, women are leading as researchers, educators, engineers, scientists, technology innovators, and more. The key is to inspire girls to maintain their interest in STEM fields beginning at a young age, through middle school and on into high school, and their college years. Groups like the Society of Women Engineers (www.swe.org), National Girls Collaborative Project (www.ngcproject.org), TechnoloChicas (www.technolochicas.org), and Million Women Mentors (www.millionwomenmentors.com) are working to spark the interest and confidence of girls and women to pursue and succeed in STEM careers through mentoring. Tell us a little bit about what inspired you to choose your career field. What interested you the most and why did you choose LADWP? I chose to be a Civil Engineer because I want to change the world! I studied engineering at UCLA with a focus on water resources and environmental engineering. With this degree, I knew I could go anywhere in the world and be able to contribute to the safe delivery of clean water to people and to protect our environment. As a basic need, water unites all human beings on Earth and this was the best kind of motivation for me. I was ecstatic to come to LADWP to apply my learning right here, serving the city where most of my family lives. What have been some of the major career highlights/projects for you while working at the Department? Since joining LADWP in 1992, I have worked in pipeline design and construction, environmental compliance, water quality, recycled water, water rights, and groundwater cleanup. As Assistant Director of Water Resources, I lead a team to plan the water supply for the 4 million people in the City of Los Angeles, including capturing more stormwater, conserving, and expanding the use of recycled water and groundwater. In previous roles, I had the opportunity to manage the Department’s $500-milion remediation strategy to clean up the San Fernando Groundwater Basin and grant applications totaling over $250 million. I have been privileged to represent Los Angeles on the Colorado River Board of California and on the Board of Trustees for Water Reuse California. One of the roles I have enjoyed the most is as a member and alumnus of the LADWP Speakers Bureau which has given me a chance to interact with members of the community and learn first-hand about the impact of our work on families and businesses. Where do you see the future of women at the Department? The future is bright! We have an incredible opportunity to become ambassadors for gender equity. Our employees can more closely represent the communities that we serve in all classes and at all levels of our organization. With our Equity Metrics Initiative and the Mayor’s Gender Equity Initiative, LADWP has the chance to lead in this area. Just last year, I was honored to help launch of the Society of Women Engineers Professional Affiliate Group at LADWP to support our talented employees and influence the next generation of engineers and STEM professionals. There is much more to come! What advice would you give to young girls or parents of young girls regarding STEM? Keep your options open! Throughout elementary, middle, and high school, math was always my toughest subject. I had to put in 10 times the work to get the high grades in math that I was achieving in all my other classes. In fact, my favorite subject (by far) was English, particularly poetry and creative writing. Like many young students do, I mistakenly believed that math must be my best and favorite subject in order to become an engineer. I was wrong! Math is a skill and, like other skills, it can be improved with practice and dedication. It took the encouragement of Mrs. Anna Cohen, my Chemistry/Biology teacher, to nudge me in the right direction. She saw my potential to excel in STEM and pushed me to participate in science field trips and ultimately to apply to UCLA and launch my career in engineering. I still very much enjoy writing so I have not had to give up that interest. My advice is to keep an open mind and give it your all. You will be thrilled to watch all the doors that will open as a result.